In the ever changing world economy, successful globalization is not achieved by simple formula. 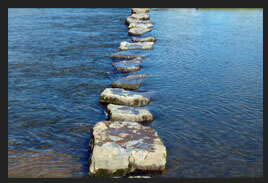 Rather, there is a path with predictably challenging steps along the way. Each looks formidable; all can be overcome. Facing the Great Unknown: Company leadership acknowledges the need to expand globally but simply is not confident about the "where & how." The TPMP Solution: Provide market analysis and discovery services leading to identification and validation of high impact partnership opportunities. Ready to Exit: Your Company took the first big step, but divergent partnership priorities portend an early retreat. The TPMP Solution: Matching & development activities leading to new/ functioning partnerships which are subsequently monitored and supported by experienced “in-country” executives serving as an extension of your leadership team. Stalled and Frustrated: Your Company has a good working partnership, but progress is slow and needs to be accelerated. The TPMP Solution: On-the-spot problem solvers / business leaders with practical understanding of what causes ventures to stall and the necessary actions leading to profitability and growth. Ready to Grow: A profitable presence has been established and the time for aggressive growth is at hand. The Next Big Step: Confidence is high and leadership is ready to expand regionally.